Who knew the world of books could be so deadly? My thanks to my contacts at Pegasus Books, Iris Blasi, Katie McGuire, and Maia Larson, for my review copy of this book. You ladies rock! This is a volume of fifteen short tales that are mysteries that evolve bookstores, book collections, rare books, authors, etc. They vary in length but most have been written very well. I really enjoyed the book! I want to touch on each story briefly. I do not intend to give major spoilers but maybe a warning should be given. "An Acceptable Sacrifice" by Jeffery Deaver deals with a Mexican drug lord with a taste for rare books. "Pronghorns of the Third Reich" by CJ Box deals with a man who believes himself wronged and seeks a book collection in order to square things. Kudos for being based on a single genuine historic photo! "The Books of Ghosts" by Reed Farrell Coleman was a very interesting story. The Book of Ghosts is about a legendary book said to be written in a Nazi Concentration Camp. The historical part of this story is an insight into the horror of camps like Auschwitz… This story is the runner-up for "Best in Book…"
"The Final Testament" by Peter Blauner is a nice piece of historical fiction dealing with Sigmund Freud! "What's in a Name?" by Thomas H Cook relates the story of a world where WWII never took place. In this alternate history, a man is trying to publish a controversial book. Excellent! In the "Book Club" by Loren D Estleman, the prolific author's hero is a former detective turned bookseller! "Death Leaves a Bookmark" by William Link deals with a certain Lieutenant Columbo, who likely needs no introduction! In "The Book Thing" by Laura Lipton, the author writes about a real-world bookstore where all books are free. "The Caxton Lending Library" by John Connolly deals with a most unusual library in a most unusual place. This story is most definitely worthy of the award of "Best in Book!" "The Bookcase" by Nelson DeMille tells of a man who died when his heavy bookcase fell on him. Was it an accident, suicide, or murder? 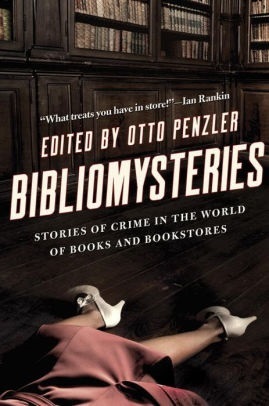 This book is a worthy addition to any mystery lover's collection! I give the volume five stars!